I have been working on large scale ceramic forms which I have placed in the landscape. My main aim is that the work should not compete with the landscape, but evolve within the environment. With this in mind I have introduced other minerals into the Raku ceramic surface such as iron and copper. With the elements of time and erosion, the individual piece takes on its own developing surface. Recently, one of these large commissions has taken me again to India. My Client suggested I make it on site. Now I have discovered Udaipur in Rajasthan where I come for inspiration, when my studio in Bath in England gets cold in the winter months. 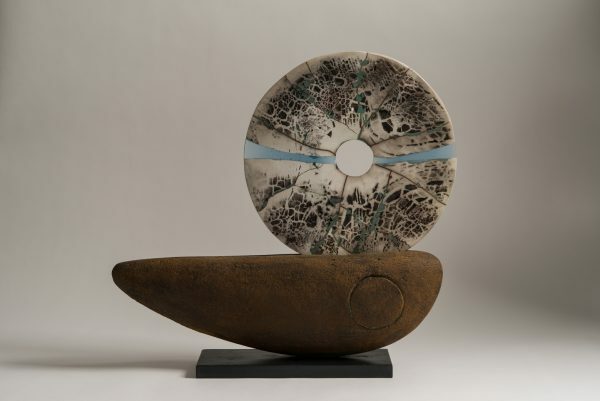 This has introduced me to other artists and craftsmen enabling me to work with a range of different materials, such as glass, marble, stone and Damascus steel. In practice I go by the set of my pants. I have always worked this way, not going by any particular rules or methods. I find it joyful to work with many different materials. Each has its own character, its own limits, its own tolerance – some materials fight back, some play the game. Finally I think it’s the material that is in charge and it will only let you make what it wants. It is my job to push it to its limits and somehow an equilibrium is made between maker and material.